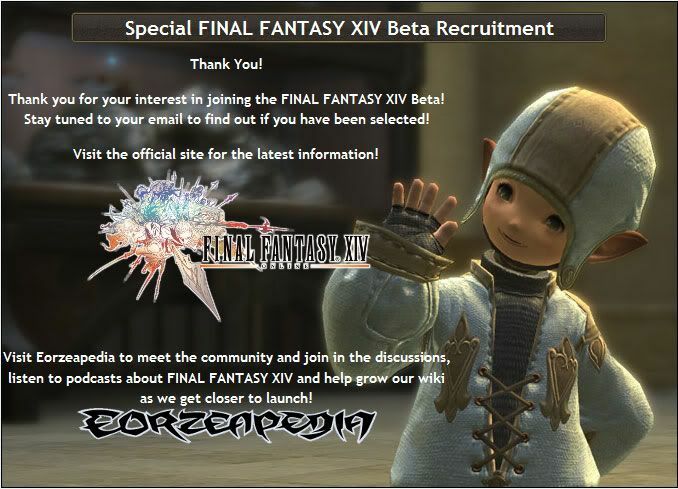 Just a heads up, there's a site out that allows current FFXI subs to get a reconsideration for admission into beta. Added note: This promo only will be running from March 4th to March 7th, so act fast before it's gone! From what I understand, only two sites have this promotion going on; allakhazam and ffxiclopedia. Mix that with the fact you have to have an active FFXI account and the odds are seriously stacked in our favor. I just hope I didn't mess it up. I'd forgotten to link my FFXI POL account with my SE account before I submitted. It's linked now but I'm gonna kick myself if I messed it up.